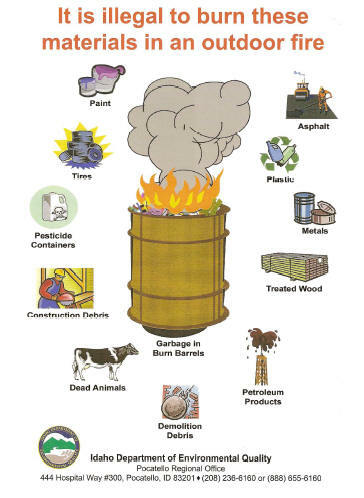 State Law prohibits burning of Household waste as per rules and regulations found in the I.D.A.P.A code 16.01.01 sec:603 and 611 This includes burn barrels. Improper Dumping is not only prohibited, but violators will also be responsible for the cost of cleanup as per Idaho Code 31-4410. This is very unsightly and costly for the County. Contaminated Soils will not be accepted at any landfill other than a municipal solid waste landfill that is permitted to accept such waste. Illegal burning is punishable up to a $300 fine and citation from Bingham County or a $10,000 fine from IDEQ.